Recently, MillionaireCasket.com has added a new collection of cedar caskets to its online catalogue. Moreover, the company is now offering big discounts on these items. 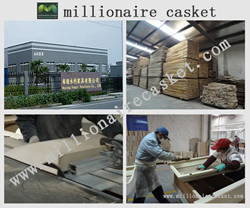 When it comes to cost-effective caskets, China manufacturer MillionaireCasket.com’s items are great items. Recently, the company has added a new collection of cedar caskets to its online catalogue. Moreover, the company is now offering big discounts on these items. For additional information, MillionaireCasket.com is famous for its high quality caskets, great customer service, speedy delivery as well as competitive prices. As a professional casket manufacturer, the company offers flexibility in terms of material species, finish and colour, interior fabric and styles. The wood caskets from Millionaire Casket are absolutely 100 percent manufactured with top quality materials; a lot of them are selling well in the current market. The company seeks to benefit the distributors from around the world. It aims to be an outstanding funeral supplier and offer a wide range of top quality products (like metal caskets, cremation caskets, solid wood caskets, veneer caskets) for new and old customers. More information can be found at http://www.millionairecasket.com/73-cedar-caskets.